Yesterday I set out to water the fruit and nut trees for the first time this year. 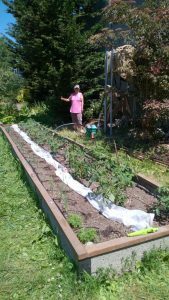 I thought it would be a lot of work because 1) it has been hot and, 2) because May precipitation was a record low .3 inches and June is just average at 1.29 inches so far. Well, I was wrong. 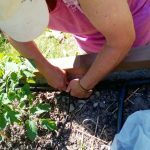 Thanks to a couple of handy tools we were able to purchase (thanks to a City of Seattle grant for our Water Conservation Project) I ended up watering just three of our 13 trees. 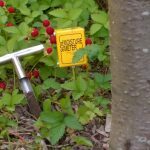 Our tubular soil sampler (0.5″ diameter x 7″ length) and soil moisture meter (9″ probe) literally go hand in hand. After calibrating our moisture meter, we drove it into the ground and noted the reading for the percent of water in the soil. Then we inserted the soil sampler, gave it a twist, pulled it up, and inspected the soil plug to see if it confirmed the meter reading. With the use of these tools, we will become more and more confident that we are watering effectively. We now chart the readings we take, the amount of water we apply and then will follow-up to see if the amount of water we applied was sufficient. We have so much fine-tuning to do but it’s exciting to experiment and learn. 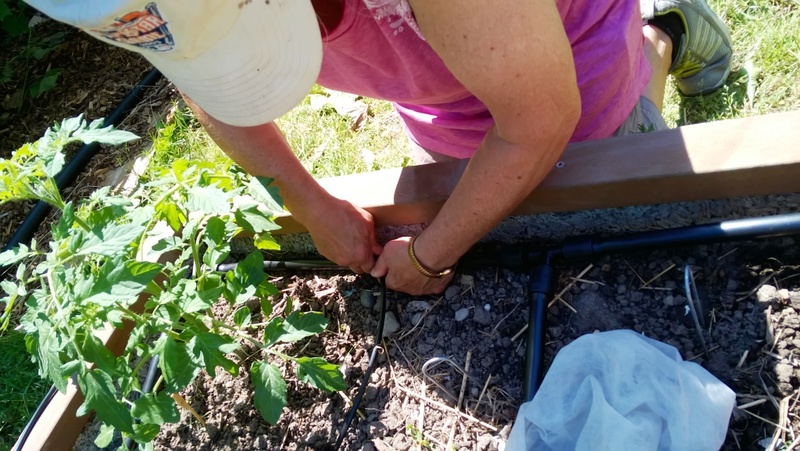 Meanwhile, Sue just finished installation of a third method of gravity fed irrigation in the tomato bed. 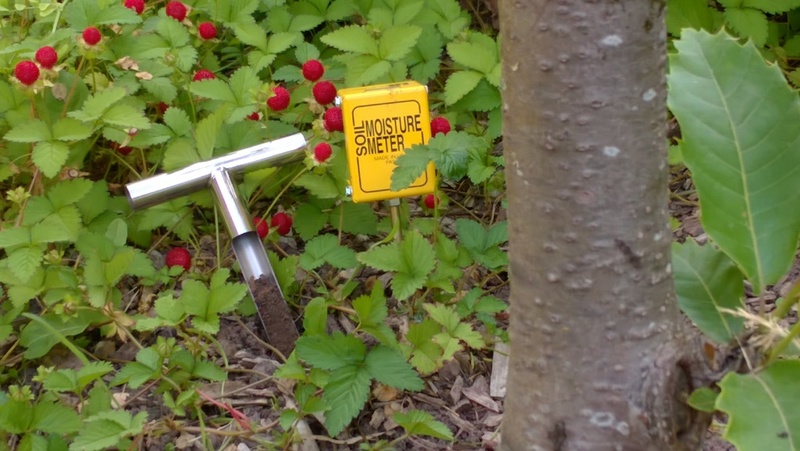 With this method, she can efficiently target certain plants for more or less water. 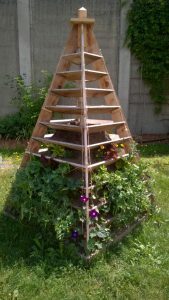 In addition, more of her time is free to care for plants like this purple flowered native Morning Glory – Ipomea purpurea (not to be confused with bindweed) in the vertical bed. 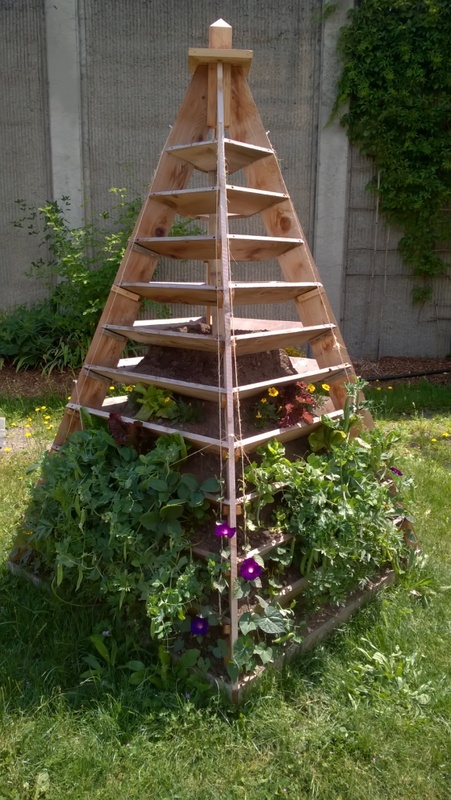 This entry was posted in Plants, Uncategorized and tagged drip irrigation, moisture meter, tubular soil sampler, vertical garden bed, Water conservation on June 21, 2018 by Ruth.